A ferry ride on the deep blue waters of Puget Sound is an easy way to view Seattle, Washington and Mount Rainier (in a distance). 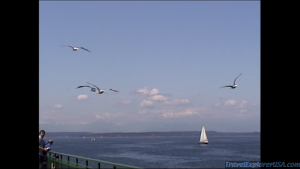 Get on a ferry to Bainbridge Island, Washington. Park your car on the ferry and enjoy the ride. The Seagulls will join you for the ride as well. Enjoy the sea breeze and watch the scenes around you.